And if that's what you want for your Christmas dinner, that's just sad. Tasty, but sad. Or is it? After all, who dictates what you can or can't have for a traditional dinner? 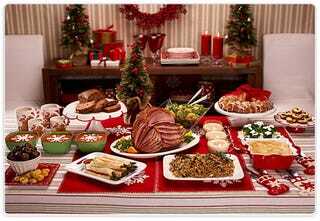 Most families will have a traditional dinner for a holiday. It might be Thanksgiving, Christmas, New Years, or some other day. Take Thanksgiving, for example. Many families will roast a turkey, have some sweet potatoes, a green bean casserole, some form of dressing, some type of cranberry sauce and pie. There are variations for every family. But the Thanksgiving dinner you had this year is probably almost identical to the one you had last year. And the year before. And the year before. And the....you get the idea. Christmas dinner is that same, except different. It's the same in that most families will have the same thing year after year. Different due to the fact that there is a lot more diversity in what people consider traditional. And what you consider traditional depends a lot on your heritage. For example, many Italians consider 'the feast of the seven fishes' to be traditional. Many Scandinavians consider lutefisk to be traditional. Many European countries consider fowl, such as turkey, goose, duck or capon to be the food of choice. OK...I'm back. What did I have? Why, my go-to snack; peanut butter sandwich crackers. But on to the point; today is Monday. Made Up Monday. I'm about to tell you something, and you get to tell me if it's true or not. But the way oysters were prepared traditional was, they were shucked and eaten raw. Or they were made into a dressing. Sometimes they would be added to a soup like a bouillabaisse or a cioppino, but generally, they were eaten whole. Around 1840, oyster stew started appearing on the menu for Christmas dinner because of the large influx of the Irish. Yes. It is the fault of the Irish that we see oyster stew today. Before they showed up, there really wasn't any oyster stew. It was the fault of the Irish. So, true or false? Did the Irish start the tradition of oyster stew on Christmas? I'll reveal the truth tomorrow. * No really, ew. Oysters are disgusting. They are like big loogies in a shell. Yuck.